The futon bunk is a versatile space saver. With a twin bed on the top and a convertible futon sofa on the bottom you can have added sleeping space in a jiffy. Leave the futon in the sofa position for reading, studying or playing video games. 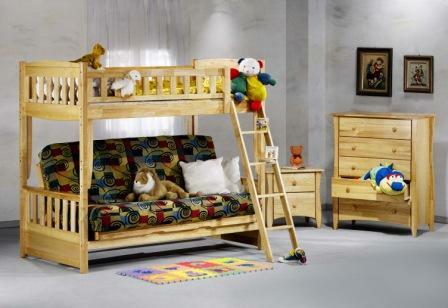 Our futon bunks are made from solid wood and come in cherry, natural, medium oak, dark chocolate or white. Mattresses and covers sold separately.